GRAFENWOEHR, Germany–Situated between the main street and the town center in Grafenwöehr is a quaint side street featuring the Culture and Military History Museum. This is the only museum in Bavaria with an exhibition about Germans and Americans living together from 1945 to almost present day. The museum’s four rooms illustrate how the city and the military training area are both heavily intertwined. Visitors can trace the presence of U.S. and Bavarian soldiers through displays, antiques, documents, oral histories, and photographs. Items ranging from a vintage U.S. Army Willys jeep to German military orders and Hitler Youth uniforms help tell Grafenwöehr’s story. Housed in its own building, visitors can immerse in the history of the training area. The exhibition catalogs U.S. Soldiers and their relationship with the training area and Grafenwöehr. The gallery presents how the Soldiers and prisoners of war lived, the Allied invasion of the Second World War, and the evolution of the Soldier. While the museum notably gives visitors an educational look into everyday life and military history in Graf, visitors may also schedule a free guided tour to the training area. The museum offers free monthly tours from April to October that includes stops at the shooting ranges and the new barracks. It also includes a look at where Graf’s most famous U.S. junior enlisted Soldier, Elvis Presley, is believed to have etched his name in a brick of the Bleidorn Tower. Presley is further remembered at the museum for his time deployed in the Upper Palatinate. The singer was on a maneuver in the military training area in 1958. He was not allowed to give public concerts during his time in the Army. Before his departure, the King of Rock ‘n’ Roll performed a surprise private concert at the “Micky Bar” in front of his father and bar staff. Today, the Culture and Military Museum commemorates this legendary performance in a permanent display. The “Elvis Department” recreates the Micky Bar featuring the original baby grand piano and stool from the show. 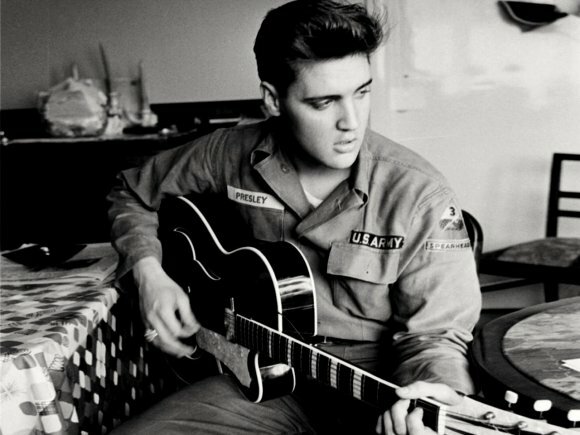 The exhibit also includes an old-school jukebox filled with Presley’s most popular music, memorabilia, and autographs. This fall marks six decades since Pvt. Presley’s time in Graf. The “60 Years Elvis in Grafenwöehr” special exhibition currently celebrates this milestone until March 31, 2019. The temporary exhibit will add new eyewitness testimony from two hairdressers and a former saleswoman to its existing database of video recordings. Public programming and tours will accommodate the exhibit. For more information about the museum and the special exhibition, visit www.museum-grafenwoehr.de.